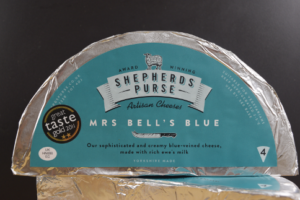 Like Olde York last week, this is another ewe’s milk offering from Shepherd’s Purse. 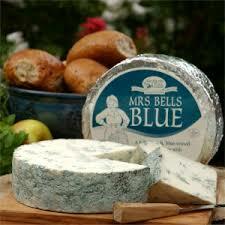 Pale white in colour and streaked with blue-grey veins, Mrs Bell’s Blue is a piquant blue not dissimilar to Roquefort, but with more creaminess and less saltiness. It has a pleasant tang that goes well with fruits. It also makes a nice contrast to our Gorgonzola Dolce, which is a younger, fruitier cow’s milk blue I’ve been enjoying with quince jelly. Come in and try both!